It's Halloween Week! I absolutely love this time of year. I am one of those rare girls who love scary movies. I love the adrenaline rush, having an excuse (do I even need one?) to cuddle up to my husband and bury my face in his chest, and hanging onto that hope deep down that the innocent people in the story will get out alive. It's also an ego boost because I think to myself, "What an idiot! Why are you doing that? Take the gun, kick him where it counts, or hide there instead of under the bed. Every murderer checks under the bed. I would be soooo much smarter in this situation." Haha. One of my favorite dating memories is actually a Halloween memory. Josh and my dating experience was pretty horrible. I was very analytical and several times we almost broke up. That's a story for another time. It happened to be Halloween week 2010. My parents had left to go out of town the week before and my mom told me, "Take these next two weeks while we are gone and just pray really hard about your relationship with Josh and decide if you really want to be with him. If at the end of those two weeks, if you are still struggling with anxiety and doubt then you really need to break up with him and move on." This had been going on for a long time and I just could not get peace about our relationship. Those next two weeks changed everything. I believe that's when I really started falling in love, or at least truly realizing it and that I could never in a million years let this guy go. I didn't share with Josh what my mom had told me but just kept it to myself, prayed, and decided that if these were the last two weeks we had together than I wanted to make them memorable. My brother, Nate, was in town and after I closed up shop at Coldwater Books, where I was working at the time, we headed over to the bachelor pad (where Josh lived with my brother in law and another friend). Josh just happened to have rented The Shining that night. I wasn't used to scary movies so it completely freaked me out. I remember glaring at Josh at one point during the movie and saying, "WHY ARE YOU SHOWING ME THIS???" We still laugh about it. During that next week he introduced me to Halloween (the movie), I carved my first pumpkin, we roasted pumpkin seeds, went on a haunted ghost tour around Florence with a local historian, took in a haunted house or two, had bonfires, and attended a Halloween party at a friend's house. I had never fully experienced Halloween and I was loving every minute of it! I found myself instead of analyzing the relationship, worrying about how I was going to live without my best friend who I enjoyed experiencing everything with. It made the moments much more special and meaningful. I didn't want to lose this amazing person I could be myself around, laugh at cheesy horror movies, grab onto when turning the next corner of that haunted house, and preparing costumes together. For the Halloween party we tried to come up with some cheap and creative costume ideas. 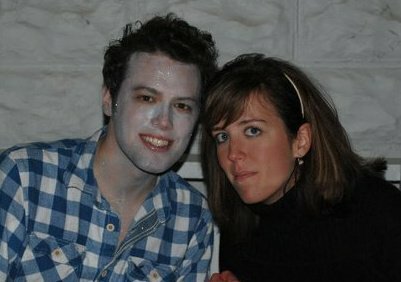 I pitched the idea that Josh should go as Edward Cullen. There are few things Josh hates more than Twilight so for him to agree to this was a definite sign of true love. I thought for a few seconds of going as Bella but I wouldn't have much of a costume. I decided to go as a psycho killer in a mask instead because first of all, I could just dress in black and wear a mask Josh already owned, and second, let's face it, the killer would have more personality and be loads more interesting than going as Kristen Stewart. Josh made an amazing Edward and people knew right away who he was! Success! We poofed his hair up and gave it lots of body, he painted his face and chest with white paint, sprinkled some sparkles on his skin and tada! I've included an old photo of us at the party for kicks and giggles. It's pretty dark so you can't see details extremely well, and I'm not wearing my mask, (obviously) but I still like this photo of us. That Halloween was such a special time. I realized that I didn't want to spend future Halloweens with anyone but Josh. Also, because of Josh, Halloween has become one of my favorite holidays. We already have our costumes picked out for this year's party and I am so excited! I am reminded how blessed I am to share another amazing holiday with this awesome guy. I think those closest to me would say my current favorite color is white. White walls, white dresses, white mugs, white kitchenware, white bed linens. I love the simplicity and clean look the crisp color conveys. There is something so feminine and angelic about a white lace dress. I like to think of white walls as a canvas on which the creative mind has no boundaries. You can either add splashes of color in rugs, artwork, or bold furniture, or you may choose to leave the room as minimalistic as possible. I have read articles and followed people on Instagram that have painted their trim, walls, and ceilings all the same color throughout their home and pulled in color accents from furnishings or artwork. It gives a home a very clean, cohesive look. I have not yet gone to that extreme but I do love some good neutrals. My home is mainly made up of white, greys, a warm, coffee color for our den, and you guessed it, more white. I like having a continuous feel throughout the home. When I first got married I picked out the colors for our newly renovated home. Every room was a different color and some were very bold choices. I chose anywhere from deep blue, to baby blue, to grey, to dark brown, to mustard yellow. It's funny now but the bolder choices were the ones I grew tired of the quickest. I would hit a wall when decorating because I always thought to myself, "Well, we can't buy that sofa because it wouldn't match my baby blue walls" or "that color would clash because it won't match my electric blue study". The only two original colors I have chosen to keep four years later is the coffee-colored den because it is my husband and I's favorite room to cozy up together at the end of the day. It complements the stones in the wall to wall fireplace and just has that wrap-your-arms-around cozy feel.The other color we have both chosen to keep is the light grey in our dining room and kitchen. It has been a favorite neutral for us. It is a good balance to bright white cabinets and soft linen tablecloths. I also love that I can bring in gold or silver or white accents at various times for whatever mood I am feeling without it clashing with the rest of my decor. If bright and bold colors are your thing then go with it! I would just suggest choosing a color palette for your home and stick with it. You want colors that will complement each other and not distract. Draw color inspiration from a certain priceless possession weather it be a painting or a statement piece and pull color from that object. Lastly, be sure to choose a color you love! Nobody wants to paint every two or three years. Enough of my home-designer-wannabe ramblings for now. I'm off for my second cup of coffee and to begin painting the master bedroom. I would ask you to guess the color but I think you already know what it is.